About half of the glucose that may be included in the medium is respired to provide energy for growth. The remaining half (approximately) is used for biosynthesis of the macromolecules and other metabolites of the hypha. The fact that about half the glucose in the medium is used for respiration to generate energy and about half is used for biosynthesis explains why the growth yield on glucose is about 0.5; growth yield varies depending on the carbon source in the medium (see the section Growth yield below (CLICK HERE to view now). Oxygen is poorly soluble in water and solubility declines with elevated temperatures (Table 4). Thus, less than 0.2% of the 5.35 g of oxygen which is required for the complete oxidation of 5 g glucose is present in solution in water saturated with air. It is therefore essential to ensure that oxygen is continuously incorporated into the medium as the culture grows; oxygen transfer from the gas to the liquid phase is an important component of this. According to Pirt (1975), the simplest conceptualisation of gas absorption is the stationary liquid film theory (Fig. 2). This envisages a stationary liquid film between bulk atmospheric air and the bulk aqueous medium, with a concentration gradient of dissolved gases through the stationary air-water interface film. Fig. 2. 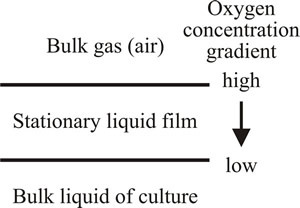 Process of oxygen absorption according to the stationary liquid film theory, which envisages a stationary liquid film between bulk atmospheric air and the bulk aqueous medium, with a concentration gradient of dissolved gases through the stationary air-water interface. where Roxygen = oxygen transfer rate per unit liquid volume, KLa = mass transfer coefficient (per hour), C*oxygen = concentration of oxygen which could exist in bulk liquid phase if it were in thermodynamic equilibrium with the gas phase, and Coxygen = actual concentration of oxygen in the bulk liquid phase. When the liquid is saturated with oxygen C*oxygen = Coxygen and no oxygen transfer occurs. Fig. 3. Effect of KLa on microbial growth in batch culture. Fig. 4. 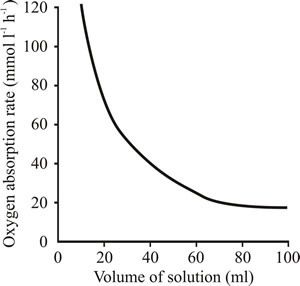 Effect of liquid volume on the oxygen transfer rate. The plot shows how the volume of liquid in a 500 ml conical flask influences oxygen transfer rate when the flask is agitated on an orbital shaker operating at 250 revolutions minute-1. KLa is a characteristic of a particular fermenter operated in a particular manner and it has a profound effect on microbial growth in the fermenter (Fig. 3). Fig. 3 shows that when biomass is grown under the same cultural conditions (other than KLa), the KLa of the fermenter affects biomass production; that is, the cultures become oxygen limited at different biomass concentrations. Consequently, fermenters used to grow aerobic organisms, and that category includes the overwhelming majority of fungi, need to be designed to maximise KLa values. 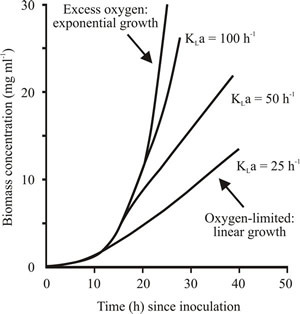 When a culture becomes oxygen limited, growth is stoichiometrically related to the quantity of oxygen transferred (shown by the linear part of the growth curve in Fig. 3). The larger the KLa the higher the aeration capacity of the fermenter. The oxygen transfer rate (KLa) can be determined by measuring the rate of oxygenation of a 0.5 M solution of sodium sulfite to sodium sulfate in the presence of a catalyst. The sulfite oxidation rate is equivalent to the oxygen-transfer rate of that particular fermenter operated in that particular way. KLa is made up of a constant (KL) which is effectively a measure of resistance to oxygen transfer, and the interface area, a. In a still liquid the interface area is the area of the fluid surface; in an agitated culture this area depends on the number and size of the bubbles of air that the agitation introduces into the fluid medium, and this area can be increased by decreasing bubble size and increasing bubble number; and this is the function of the agitation process (see below). Effect of the level of agitation, which is measured in terms of the shaker speed and throw (the physical extent of the reciprocation) in shake-flask cultures. Increasing speed from 150 to 300 rpm results in 250% increase in oxygen solution rate.